On Thursday, October 25, the Cancer Research Institute held its annual awards gala at The Metropolitan Club in New York City to celebrate its 65th birthday and honor scientific and philanthropic leaders who are dedicated to fueling the development of immunotherapies for all forms of cancer. The event also celebrated CRI’s role as the leader in the field of immunotherapy and recognized six and a half decades of CRI’s steadfast commitment to funding scientists whose work has led to many breakthroughs and discoveries in cancer immunotherapy. Jill O’Donnell-Tormey, Ph.D., and Jacques C. Nordeman. Photo by Arthur Brodsky. The evening began with cocktails in the Great Hall, where more than 280 guests brimmed with excitement in anticipation of the night’s ceremonies. In addition to this year’s recipients of the Oliver R. Grace, William B. Coley, and Fred W. Alt awards, James P. Allison, Ph.D., from The University of Texas MD Anderson Cancer Center, director of CRI’s Scientific Advisory Council, and winner of the 2018 Nobel Prize in Physiology or Medicine was the night’s special guest of honor. Also among the attendees was James Watson, Ph.D., who received the Nobel Prize in Medicine in 1962 for his co-discovery of the molecular structure of DNA. Drs. Lewis lanier, Robert Schreiber, and James Allison at CRI 65thBirthday Celenbration. Photo by Arthur Brodsky. During cocktail hour, guests were treated to a special musical performance by The Checkpoints, a band composed of immuno-oncologists and cancer researchers, who played covers of classic pop and rock hits, setting the tone for a fun and memorable night ahead. The Checkpoints perform at the 2018 CRI 65th Birthday Celebration. Photo by Arthur Brodsky. Later on, the guests were ushered into the main ballroom and were warmly welcomed by emcee Cynthia McFadden of NBC News, who spoke throughout the night of CRI’s history and impact. Her remarks, along with those from the other presenters, who included CRI’s co-chairmen of the board and several members of its Scientific Advisory Council, were amplified by the presence of Sharon Belvin, a stage 4 melanoma survivor who joined a clinical trial of the immunotherapy ipilimumab (Yervoy®), and has been in remission for over a decade. 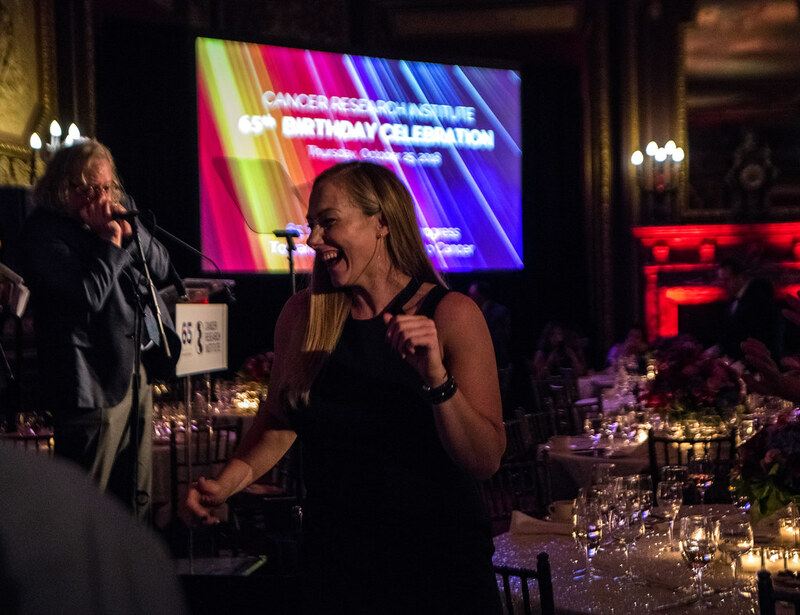 Mrs. Belvin was one of many cancer patients whose stories were told throughout the evening and exemplified the lifesaving impact of CRI’s work and the scientists it funds. Sharon Belvin and Dr. James Allison at CRI 65th Birthday Celebration. Photo by Amber De Vos, Patrick McMullan Company. In acknowledgement of these scientific discoveries and advancements, the event’s program kicked off with the bestowment of CRI’s highest honors. Robert Schreiber, Ph.D., from the Washington University School of Medicine presented the William B. Coley Award for Distinguished Research in Basic and Tumor Immunology to Miriam Merad, Ph.D., from Mount Sinai for her important contributions to the discovery and understanding of the biology of immune cells and their adaptive immune responses against cancer. Schreiber also honored Padmanee Sharma, M.D., Ph.D., from The University of Texas MD Anderson Cancer Center with the Coley Award for her work in the discovery of immune pathways in tumor elimination after treatment with anti-CTLA-4 checkpoint immunotherapy, which in 2011 became the first checkpoint immunotherapy to receive FDA approval. Drs. Padmanee Sharma, Robert Schreiber, and Miriam Merad at CRI 2018 Awards Gala. Photo by Amber De Vos, Patrick McMullan Company. Ellen Puré, Ph.D., from the University of Pennsylvania and Penn Vet Cancer Center presented Boris Reizis, Ph. D., from the NYU School of Medicine with the Frederick W. Alt Award for New Discoveries in Immunology. The award honored Reizis’ work in advancing the understanding of dendritic cells and immune responses through the elucidation of signaling pathways and regulatory molecules. Honorees and Speakers at CRI 65th Birthday Celebration. left to right: Cynthia McFadden, Paul Shiverick, Perri Peltz, Padmanee Sharma, M.D., Ph.D., James P. Allison, Ph.D., Jill O’Donnell-Tormey, Ph.D., Robert Schreiber, Ph.D., Andrew K. Tsai, Miriam Merad, M.D., Ph.D., Boris Reizis, Ph.D., George D. Yancopoulos, M.D., Ph.D., and Ellen Puré, Ph.D. Photo by Amber De Vos, Patrick McMullan Company. Annually, the Oliver R. Grace Award is presented to individuals, corporations, and foundations that have made a significant impact on medical research, patient care, or public education in the fields of cancer immunology and immunotherapy. This year, the award recognized biotechnology company Regeneron, and journalist and filmmaker Perri Peltz. Co-Chairman of the Board Andrew K. Tsai presented the first Grace Award to George D. Yancopoulos, M.D., Ph.D., president and chief scientific officer at Regeneron, who accepted the award in honor of the company’s development of successful immunotherapies for non-small cell lung and cervical cancers, squamous cell, and basal carcinoma, to name a few. Representatives from Regeneron, including George D. Yancopoulos, M.D., Ph.D. (far right), who were awarded a 2018 Grace Award. Photo by Amber De Vos, Patrick McMullan Company. CRI CEO and Director of Scientific Affairs Jill O’Donnell-Tormey, Ph.D., presented the second Grace Award to Ms. Peltz, in recognition of her commitment to creating dialogues around patient education and treatment, including cancer immunotherapy. O’Donnell-Tormey also noted Ms. Peltz’s longtime dedication to the CRI Irvington Postdoctoral Fellowship Program. Jill O'Donnell-Tormey and Perri Peltz at CRI 2018 Awards Gala. Photo by Arthur Brodsky. The evening concluded with a video of messages from cancer patients to Dr. James Allison and scientists like him, thanking them and CRI for our work to bring promising immunotherapy treatments to the clinic to create a future immune to cancer. Thanks to all those in attendance, this year's Awards Gala was one of CRI’s most successful—raising nearly $940,000 to support our research programs! We deeply appreciate those who gave their support, and most especially the 2018 Awards Gala Co-Chairs and Presenters. Robert A. Bradway, Chairman and CEO, Amgen Inc.
Jacques C. Nordeman, Chairman, Nordeman Grimm, Inc.
Paul C. Shiverick, Partner, Seminole Management Company, Inc.
Andrew K. Tsai, Managing Principal, Chalkstream Capital Group, L.P. The Checkpoints. Photo by Amber De Vos, Patrick McMullan Company.